This tastes so completely, wonderfully, amazingly good! After we'd polished off the Thanksgiving leftovers and every last shred of turkey was gone, I still had a bit of butternut squash left in the veggie crisper. I'd already maple glazed it and served it up in a delicious salad so I needed another idea. 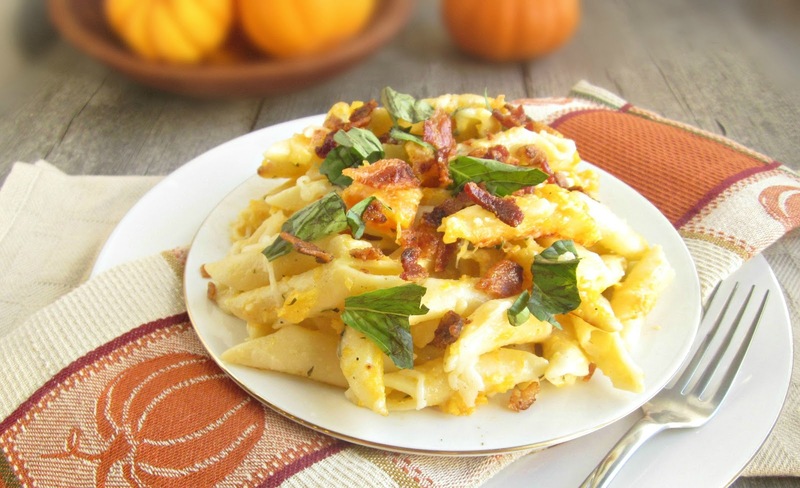 All the talk lately of pumpkin mac and cheese dishes gave me an idea and it came out extraordinary! Technically this recipe makes four servings but I'll admit that Brian and I put the baking dish between us and polished off every yummy bite. Enjoy! Toss the butternut squash pieces in the olive oil, season with salt and pepper and place on a baking sheet lined with parchment paper. Roast in a 400 degree oven for about an hour or until the squash is extremely tender. Place in a bowl and mash thoroughly. Cook the pasta in boiling salted water until tender and drain. While the pasta is cooking, add the butter to a large saucepan along with the shallots. Cook on low heat for a few minutes until the shallots are translucent. Whisk in the flour and cook for 1 - 2 minutes. Whisk in the milk and the mashed squash until thoroughly combined. Add the basil, half the mozzarella cheese and half the Parmesan cheese. Add the pasta and combine thoroughly. Pour the mixture into a baking dish and top with the remaining mozzarella and Parmesan cheese. Bake in a 400 degree oven for about 20 minutes or until the cheese is melted and the top is lightly browned. Top with the crumbled bacon and serve hot. Makes four servings. That looks great! 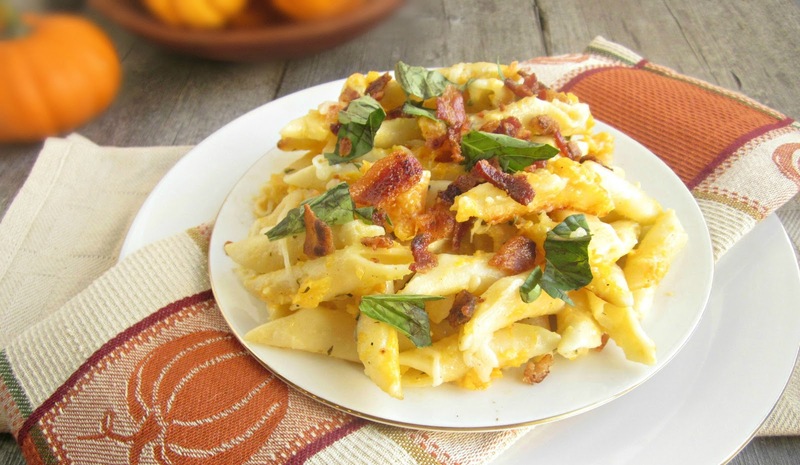 What a great way to use butternut squash! I've never heard of anything like this! But it sounds amazing and I want a huge bowl of it! The addition of bacon is genius! Great way to use up the leftovers. I love penne pasta bakes. This one looks delicious! I am all for trying something new, this looks wonderful! This looks so delicious!Love pasta bakes and butternut squash is such a delicate and flavorful vegetable.Lovely recipe! I am going to make this tonight but I wanted to tell you that I love your website/blog. :) I will let you know on the squash bake. @Anonymous - Thank you so much for the compliment! I hope you enjoy the squash bake as much as we did. With your description, you have me sold! I love the use of butternut squash, YUM!. When I saw the picture, all I could say was yes yes yes yes yes yes YES! Haha I love butternut squash. And this pasta bake is perfect for chilly evenings.